Having spent some years in the South when I was a kid, I got used to trying all sorts of foods. Jambalaya was a dish that was always highly regarded, and people would seek out restaurants for a great plate or bowl of hot and spicy Jambalaya (and red beans and rice too). I have to admit that I don’t make it too often at home, and that might be because I tend to like it on the spicy side while my kids don’t like spicy food all that much. Since it had been a while since I had it, I decided that I better whip up a Keto-friendly recipe of Jambalaya, and man is it good! Despite possibly looking like a complicated dish to make, one thing should be kept in mind, and that is that you will only be using one pot to make this dish. That keeps it simple, since all you have to focus on is what to add and when. The flavor at the end of the dish is oh so worth it too! If you don’t like your Jambalaya on the spicy side, you can omit the Cayenne Pepper I use, and also substitute the Old Bay for some Paprika. That would tone the spicy levels way down, while still preserving the essential flavors of this dish. Another thing to note is that I do not recommend making this dish with previously cooked shrimp, as they will get overcooked in this dish when you re-cook them. Just use raw shrimp, and be sure to peel it (tails and all) before you cook it. I see some people make Jambalaya with whole shrimp, and I just don’t think it works that great. 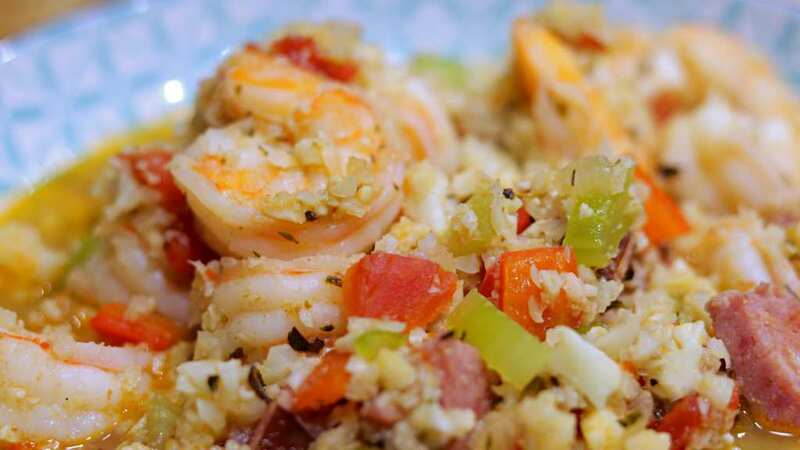 I’m always looking forward to your comments and your modifications, so please feel free to chime in and comment below how you like to make your Jambalaya so we can all share some ideas about this great dish! Heat up a Large Stock Pot or Dutch Oven on the stove to Medium-High Heat. In a small bowl mix together the Granulated Garlic, Onion Powder, Thyme, Oregano, Basil, Old Bay, and Cayenne. Add 2 Tablespoons of Grass-Fed Kerry Gold Butter and melt in the Dutch Oven. Add the Riced Cauliflower, season with 2 Teaspoons of the dry spice mixture, and saute for about 5 minutes on Medium-High Heat. Remove the Cauliflower Rice from the Dutch Oven, and set aside for later. Add 2 Tablespoons of Grass-Fed Kerry Gold Butter to the Dutch Oven, and melt. Add the 14 oz of Uncured Sausage and brown for 5 or so minutes. Add the Diced Onion, Celery, and Bell Pepper to the pot, and stir quickly to coat evenly in the butter and rendered fat from the sausage. Cook for about 3 minutes together. Add the Pressed Garlic Cloves and stir into the mix for about 1 minute to incorporate the flavor. Add the Cauliflower back into the pot, and stir the ingredients together. Add about half of the remaining spice mixture. Add the 1/2 Can of Ro-Tel with it’s juices and simmer together for a couple minutes. Pour in the 2 Cups of Kettle & Fire Chicken Bone Broth, and boil for approximately 8-10 minutes. Season the shrimp with the remaining spice mixture and then add to pot, and cook for 3-4 minutes, and then remove the Dutch Oven from heat and serve in bowls. Note: This makes a large batch, which makes 8 servings. 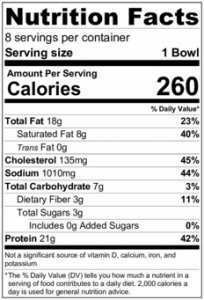 If you wish to make less, you can reduce the ingredients list accordingly to make the amount of servings that you need. My wife typically will eat just one serving at a meal, and I will typically eat two, for reference. This sounds like a good recipe EXCEPT jambalaya DOES NOT have extra ‘soup’ like your picture shows. I’m sure it is a way to avoid carbs and calories but a in real jambalaya the rice will soak up all the juices you use to cook the dish. Unless the ‘soup’ is there for extra flavor, I would cut back on the amount of stock you use in the recipe. This recipe is great! Making it again tonight! Saw this today and I made it today. WOW, it is delicious! Thank you. You have made my dinner routine more interesting! Prepared for dinner last night. 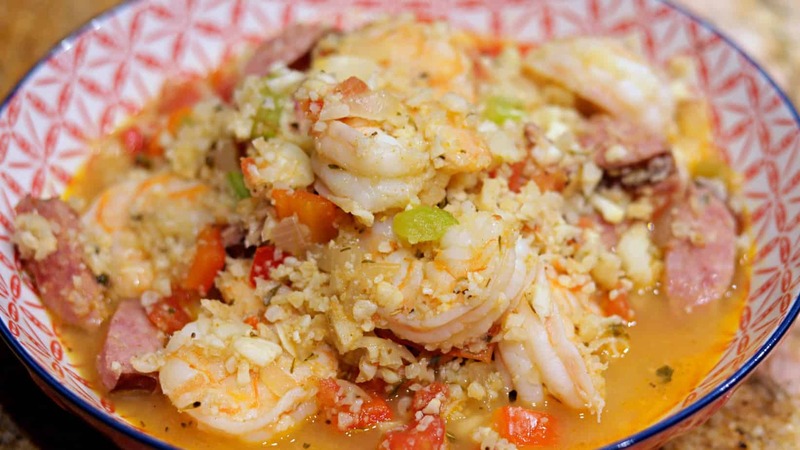 This is a great recipe if you want real cajun tasting jambalaya. I deviated from the recipe a little since I was out of rotel, so i used a can of diced tomatoes with garlic, oregano and basil plus a can of green chilies and skipped the bone broth so it wouldn’t be too soupy. Also, I added 1 1/2 cups of shredded roasted chicken. My husband raved about how it tastes so very close to what we enjoyed in New Orleans and Baton Rouge. He even had to have a second serving. You have hit the nail on the head with this recipe. Will be trying more of your recipes. Thanks so much for posting!!!! I buy it from a butcher that uses locally raised meat and he seasons it himself. The casings are all natural too, or he sells it in bulk without being made into links. But I prefer the Hot Italian variety that they sell because the spice has some flavor from the peppers he uses too. I would Love to purchase the Cookbook, I just cannot at this time financially! Newly Divorced by My Husband. My funds are very tight! I’ve already lost 60 pounds from the Stress of Him leaving and my World being turned upside down. With my Family! Added 2 large chicken beasts after step 5. Used paprika instead of old bay as I was out of that. My husband Loves it – says the broth is his favorite! Delicious.